How Did We Get Into This Mess? : The Ferguson PD is NOT medieval. It's modern white supremacy. The Ferguson PD is NOT medieval. It's modern white supremacy. “The new Department of Justice report depicts a system in Ferguson that is much closer to a racket aimed at squeezing revenue out of its population than a properly working democracy,” wrote George Washington University political scientist Henry Farrell in the Monkey Cage blog, which runs in The Washington Post. Ferguson city employees, from the police chief to the finance director, collaborated to generate revenue through tickets and fees, according to the Justice Department. As described in the report, Farrell and others pointed out, Ferguson is reminiscent of medieval Europe, when gangster governments collected “tribute” and bamboozled the subject population at every turn. No. There was plenty of internal and external plundering of subject populations in the Middle Ages, but to make this comparison is not only to be confused about medieval community norms, but also - and far more importantly - to mistake what's happening in Ferguson. The Ferguson PD plundered a specific racially-defined subset of the population through the use of citation/fine systems, a lack of due process, all supported by white supremacy embodied in the local legal enforcement system. While governments did frequently use fines as regular fund-raising methods in later medieval cities, there the comparison ends. - The racial issue is wholly modern. - The "ticket" system to plunder a population is wholly modern. - Medieval societies were frequently oppressed, but not "bamboozled ... at every turn." Rather, they participated in complex, hierarchical modes of organizing society. When you share the post, you get this picture and caption. “Consider the definition of a racketeer as someone who creates a threat and then charges for its reduction,” Tilly wrote, citing how European states first formed during the early 1600s. Venice, for example, was inhabited by both merchants working the ports and a government with questionable motives. “Governments’ provision of protection, by this standard, often qualifies as racketeering,” he wrote. Venice in 1600 isn't medieval, for starters. Certainly urban governments often do what they can to extract wealth from their citizens and from outsiders, as possible, often in predatory ways. This happened in early modern Venice and plenty of other cities in other eras. But to focus on racketeering and protection is, again, to exclude the specific white supremacy aspects of the department and the system. This is how white supremacy replicates itself in a post-slavery, post-Jim Crow, society. And while the Middle Ages are filled with things both terrible and glorious, white supremacy is not one of them. I've said this before about the use of "medieval" for ISIS. The appellation of "medieval" to modern things that we don't like imposes distance between us (good people living now) and them (bad people living now / bad people living in the past). It excuses and excludes us from culpability for our present. The Ferguson PD is modern. 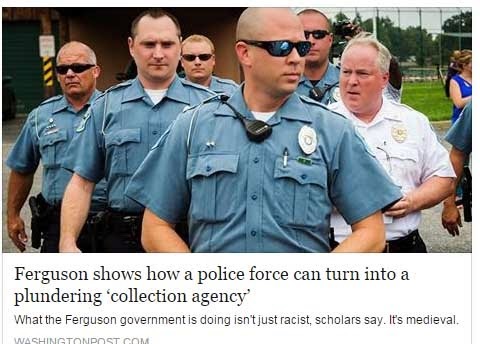 It takes modern policing, modern racism, modern judicial systems, modern urban environments, decades of predatory housing policies, white flight, and so much more to make the Ferguson PD. History can help us understand what's going on here. But the solutions, and the blame, need to focus explicitly on this moment.